I've heard a number of Leave voters asking why a transition period is necessary. Well, when Remain campaigners said Britain is still a sovereign and independent country and Nick Clegg dubiously claimed that only 7% of UK law was EU in origin - they were wrong. Disentangling from the EU is complex precisely because so much governance has been ceded to Brussels. Businesses (on both sides of the Channel) will need to prepare for Brexit. Leaving the Customs Union will mean customs declarations and additional administrative burdens for exports & imports. Leaving the Single Market will require use of an importer (or suitably qualified responsible person for some sectors). As Michel Barnier has said, Businesses should use the Article 50 period up until March 2019 as their transition period. But the additional burden on customs authorities and ports, requires new IT systems, technology and infrastructure investment and may need more time to implement. EU Regulatory agencies, systems and agreements will be lost. Leaving the EU also means leaving the Euratom treaty which currently governs plutonium for power stations, isotopes for medical devices and so forth. The EU Open Skies agreement is crucial to our aviation industry and aviation safety is governed by the European Aviation Safety Agency (EASA). There are a myriad of arrangements to be replaced. In fact, the Prime Ministers Lancaster House speech in January this year made clear the need for a "phased process of implementation" - transition by another name. 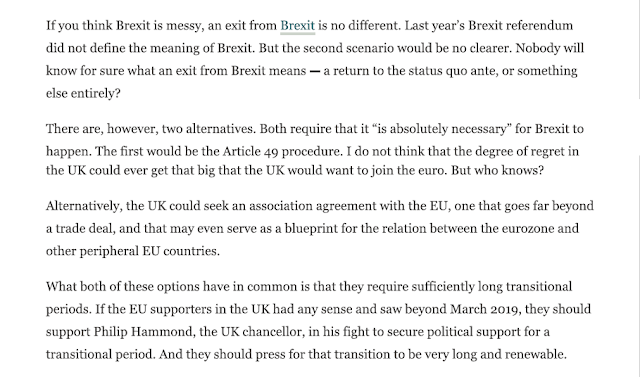 Earlier this week, Wolfgang Munchau wrote in the FT suggesting hard-core EU supporters would be best served arguing for a lengthy transition. Munchau's description of an association agreement as a model for EU's relationship for peripheral european countries is a familiar one. Many such ideas have been proposed since the Euro crisis begain in 2009. Lord David Owen published a book on EU reform of ("Europe Restructured") this nature. It can sound seductively attractive - the idea of a core of European nations pushing on with political integration while other nations have a looser relationship based on trade and security co-operation. Two arch-federalists, Guy Verhofstadt and Andrew Duff, have proposed a new form of EU membership termed "associate membership". A draft of the next proposed EU treaty includes the idea of associate membership. Unfortunately, they describe associate membership as a parking space for those countries not yet ready for full integration. Notably, Lord Owen supported Leave in the EU Referendum because he concluded that Brussels were hell-bent on integration at any price - there is no prospect of reform. It should also be noted that the EU intends that associate membership should replace the EEA agreement in time. The EU can quit the EEA agreement with 1 year's notice, offering associate membership as the replacement arrangement to the EFTA states. The idea of EFTA EEA as a safe haven from the ratchet of EU political integration ratchet simply does not stack up. So while I believe there are pragmatic reasons for a transition or phased implementation, there are key conditions that must apply. It must be strictly time limited, probably to a maximum of 3 years. 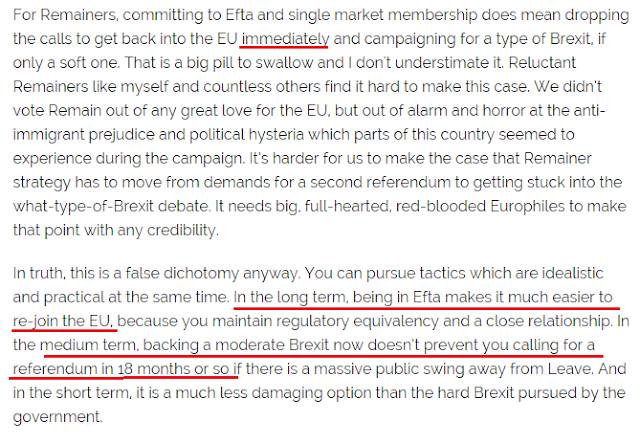 EFTA EEA membership is not suitable for such a short-term arrangement. 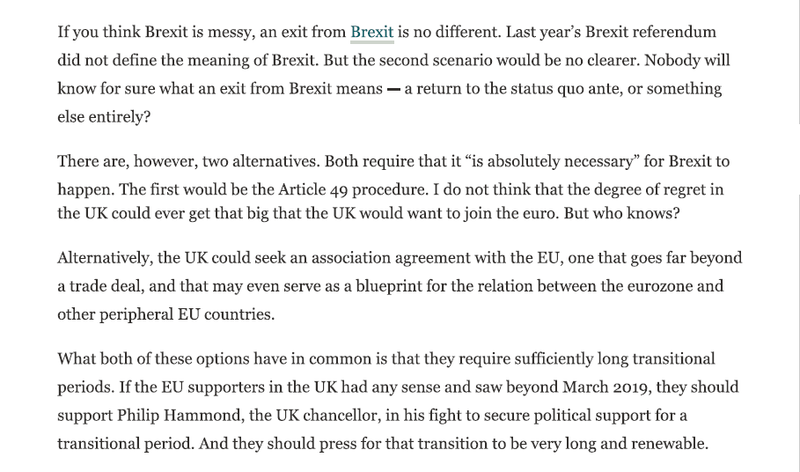 Instead, elements of current EU membership should be phased out over the transition period. The destination (a CETA+ FTA) must be described in sufficient outline within the Article 50 exit agreement before transition commences. Remain are clearly playing a long game: delaying tactics, pronouncements that Brexit is all too complex, eventually engineer EU associate membership. It seems that the EU are also playing the same game - delaying any discussion of future relationship, threats to stall the talks and so on. To counter this, the UK Government must stick to the approach laid out in the Lancaster House speech. Which includes saying No if the EU insist on playing the long game.